This Cheer U DVD introduces the fundamentals of stunting, focusing on safety and form. 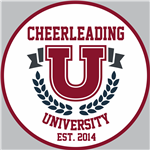 This Cheer U DVD introduces the basics of cheerleading including background information and terminology necessary to pursue education in cheerleading. This is a must for all new coaches. Are you a new cheer coach? This is a DVD you must have! This Cheer U DVD show you how to organize your time and deal with your athletes and fellow coaches to maximize the results of your team. SAVE MONEY AND BUY ALL THREE TOGETHER!